Welcome to the Cross Impact Summer Bible Study 2017! As we go our separate ways for the summertime, my burden is that we will continue to pursue God through His Word! Wouldn’t it be sad if you came back in the fall having ignored God through the summer? Wouldn’t it be great if you came back next year walking with God more genuinely and closer than you ever have before? To put it simply, we need God, we need His Word, and we need spiritual community with other believers. My prayer is that this devotional project will help us accomplish those 3 goals in this summer of 2017. 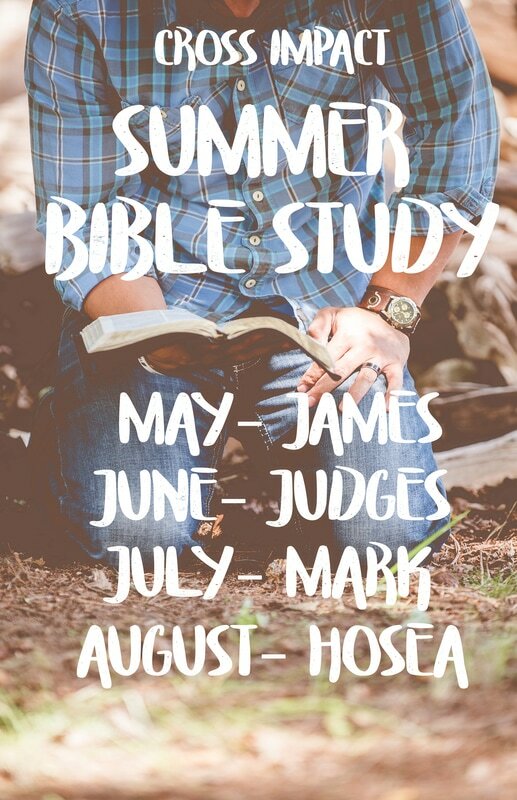 Each month, we’ll study a book of the Bible (James, Judges, Mark, Hosea). Each week, we’ll follow the structure provided from our “Living by the Book” study with the steps of OIA (observation, interpretation, application). At the end of each month, we’ll have a Google hangout where we talk about what we’ve learned. For sake of space, I’m not going to include the books themselves (as in, the entire book of James will not be included in this binder), but you have 2 choices: (1) print out the passages (double-spaced) and make your observations on those papers, or (2) read out of your own Bible and make observations in this notebook (suggested). My hope and prayer for you this summer is that you will “let the word of Christ dwell in you richly! “(Col. 3:16a) God has done such a great work in our hearts and lives this year! As best we can, we’ve honored God’s Word, and He’s worked greatly in our midst as a result of that. Don’t let that go away this summer! This could be the best summer of your life if you allow God to work in you through His Word. Let’s commit to study God’s Word together this summer!